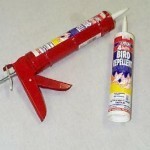 PRODUCT DESCRIPTION: A clear gel like material which is applied where birds and other nuisance animals want to land. It does not dry and will withstand rain and sun. When targeted animals touch it, they will dislike how sticky it is and avoid treated locations. It also has an active ingredient which will feel hot to their feet. 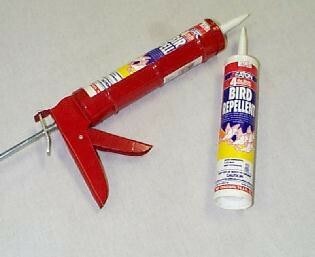 A caulking gun is needed for the application. WHERE TO USE IT: Window ledges, signs, gutters, and just about any place you'd like to deter or repel nuisance animals. RATE OF APPLICATION: Each tube can treat 10 to 20 linear feet depending on how wide the surface is you want to cover.